The early rhododendrons are just starting to flower and amongst them is the gorgeous R.cubittii. We tend to take our ability to grow these delights for granted but there are many rhododendron enthusiasts in the world who would sell their soul to be able to have these strongly scented and somewhat exotic types in their gardens. Cubittii hails from Burma, first collected around 1875 – long before that country became renamed Myanmar and shut its borders. Rhododendron buds at the point of opening are a lovely feature in themselves and cubittii has buds in dusky pink which open to big, frilly flowers, mostly white with a yellow throat and pink flush on the backs of the petals. The scent is sufficiently strong to hang in the air around it. Cubittii is one of the better options for warmer areas because it is largely resistant to the dreaded thrips which turn leaves silver. Grown in full sun, it makes a compact shrub of about 1.5m x 1.5m (the sun encourages bushier, lower growth whereas shrubs tend to stretch and reach for the light in shadier conditions). I have always advised people in cold, frost-prone areas to shy away from this variety but I am told on excellent authority that it does well in Palmerston North in sheltered positions. If it grows well there, it can be grown pretty much anywhere in Taranaki, bar sub alpine areas or the coldest inland valleys. Just plant it in the lea of some trees to protect the early blooms from frosts. 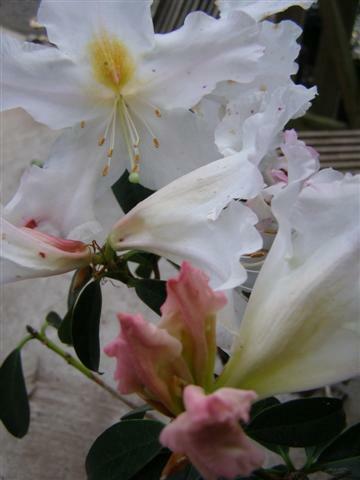 This entry was posted in Plant collector and tagged Abbie Jury, fragrant rhododendrons, Rhododendron cubittii on 16 July 2010 by Abbie Jury.